ASUS gets bigger every year and the number of things they have to show off at each show grows. They almost need their own show it's so crazy. However, we did find a few new things that computer lovers like yourselves will want to key in on from gaming and overclocking, to professional workstations, and in the home. We had a chat with JJ Guerrero, who you may know from the NewEgg YouTube Channel and the company's own channel, and asked him to show us his newest and best of the bunch. Check out the video in 1080p HD glory above or directly on YouTube! 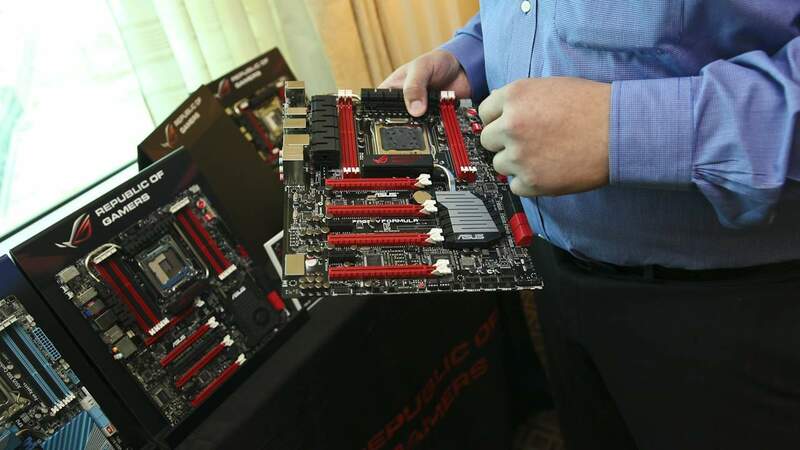 ASUS launched a whole series of X79 boards into the market, from their regular series all the way up to their top of the line ROG Rampage IV Extreme boards. Now it's time to fill in the blanks and ASUS has come back with two new boards including an ATX Rampage IV Formula which still offers SLI or CrossFire support, even with triple slot cards and a new ROG Rampage IV Formula Gene board that caters to small form factor users that want a performance board in a more manageable mATX size. The Gene actually contains components that are more resistant to higher temperatures to offset their use in smaller cases. Both boards offer a new Audio "Moat" package design technology that actually separates the audio CODEC from the rest of the board, offering cleaner audio that is unaffected by the rigors of overclocking or other interference. They also offer a new X-Socket that helps users transitioning from the previous generation X58 platform continue to use their original CPU cooler. This saves money and allows them to continue to use their high performance coolers on their new board. Tying everything together is their new AI.Suite 2 that puts all the overclocking tools in one place, versus having to open a whole bunch of different apps at the same time. ASUS has also employed social media in their new ROG Exchange software that allows overclockers to share their settings and results so that others can use them and build their own profiles. This helps to get people into overclocking easily with settings that mirror their own to start. Also on the display was the ThunderFX which uses a C-Media chipset inside customized to ASUS specifications. This little break out box connects via USB and allows high quality audio from multiple sources via analog to optical connections such as your Xbox 360 and PS3. It even has its own headphone amplifier and mic inputs and promises audiophile like quality for an enjoyable listening experience. The line up will continue to grow with a new model still in prototype that takes the audio quality that was possible on the original Essence STX audiophile card and transfers that into a USB break out box similar to the Thunder FX. This new product will create an even more potent audio experience for high impedance headphones and for studio monitors utilizing XLR connections. It won't be cheap either. 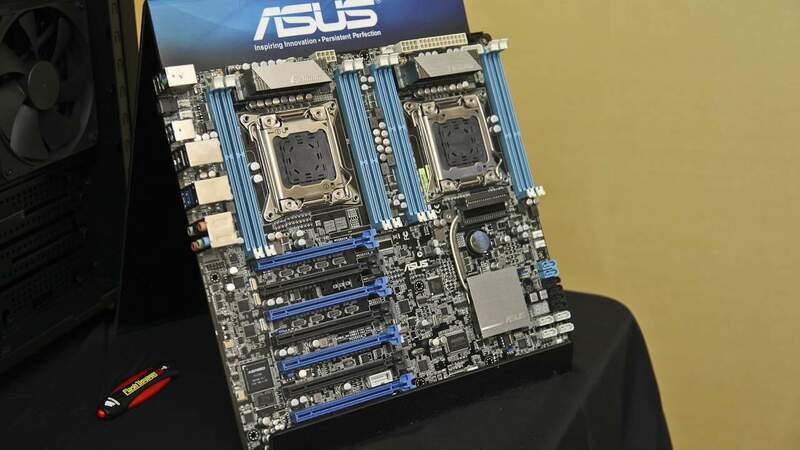 If you weren't aware, ASUS manufactures professional workstation boards that go through rigorous testing and validation to support the latest enterprise level SAS and SATA adapters including the latest GPU computing like nVidia's TESLA cards. On the Z9PE-D8 WS, you can plug them in on any one of seven fully PCI-E 3.0 compliant X16 slots. This new LGA2011 dual socket workstation board (Z9PE-D8 WS) supports up to 32 Cores using INTEL XEON processors, 8 dimm slots and 14 SATA ports. It's built for content creators and people who need a well validated platform that works in mission critical environments. For professionals, it even includes dongle support for many of the professional software packages out there that require authentication via USB. These expensive dongles can be plugged right into the board via the ASUS QuickUSB ports and locked inside the case so that your workflow doesn't grind to a halt because you can't find that USB key that unlocks your expensive software. Expect to see this out on the market very soon and it won't be cheap. Wi-Fi routers are actually not new to ASUS. They've been manufacturing routers for the mass market in Asia for quite some time and it's only within the last couple years that North American's have some to accept them as a reasonable substitute to Linksys, D-Link and other established networking players. 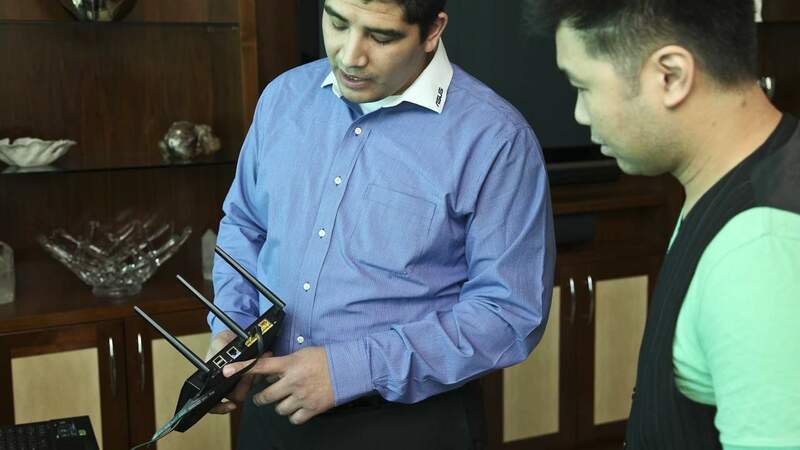 Their new RT-N66U is the new top of the line router in the family that features a 600MHz processor inside and 450Mbps wireless support via 802.11n. The product uses a completely web based setup and interface and sets up very quickly using a pin setup or you can go ahead and manually set it up yourself through the same interface. The RT-N66U even offers torrent client support internally and can be remotely accessed and the USB ports offer extra power for hard drives and proper support for multi-function printers so you can share them to anyone in your household. Plus, its three powerful antennas offer great coverage around the home and even out to you yard if you're lucky. It's coming out right after CES so look for it on store shelves soon.